When vacationers think of California’s top tourist destinations, Los Angeles and San Diego tend to be top-of-mind choices. And well they should. As the two largest cities in the state, with great dining, theme parks, incredible shopping, plenty of sports teams, and more, both locales are sure to keep visitors entertained for the duration of their stay. Nestled between San Diego and L.A., however — en route between the two cities — is a charming little town that has escaped all the urban hustle and bustle surrounding it without foregoing all the usual upsides of metropolitan areas… things like great good, stunning hotels, beautiful scenery, and a sizzling night life. That town? Carlsbad, California, population 110,972. Those who know it well (or live there) know Carlsbad is a wonderful place to visit expressly because tourism isn’t its purpose. It’s still got that small town feel with plenty of small proprietors running one-of-a-kind shops and restaurants aimed at locals but just as loved by the out-of-towners lucky enough to find these spots. Case in point? Crust Pizzeria. Crust Pizzeria — or just Crust, to its regulars — is a neighborhood pizzeria serving up handcrafted, Artisan New York style pizza one wouldn’t expect to find this far removed from the casual-gourmet dining scene. Master Pizza Chef Charlie Meola insists on using only the best milled flour to make Crust Pizzeria’s hand-tossed dough, fresh vine-ripened tomatoes from Italy, the highest quality meats and cheeses, and locally-grown veggies to make his mouth-watering pizzas. Rounding out those pizzas; flavors is Crust’s carefully selected wine list and local craft beers. Crust Pizzeria is located at 3263 Camino De Los Coches, near (conveniently enough) Sprouts Farmers Market. After that delicious pizza, Carlsbad visitors may want to take a stroll though the Museum of Music Making, which walks guests through the history of the nation’s music and musical instruments. The experience is immersive too, allowing the museum’s visitors to play several instruments. There’s nothing else in the worlds quite like it. The Museum of Music Making is located at 5790 Aramada Dr.
No trip to a coastal town would be complete without making a splash or two in the ocean, and Carlsbad has figured out how to maximize its aquatic fun. Carlsbad Lagoon is one of the best places to make that happen. 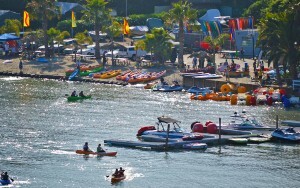 Its entrance found at 4215 Harrison Street, Carlsbad Lagoon offers canoe rentals, paddle-boating, jet skis, and even boat rentals, all at very reasonable prices. Carlsbad Lagoon also hosts several one-week camps during the summer, giving kids some dedicated time to play on the water in a well-supervised environment. And that’s just the beginning. LEGOLAND, several wineries, some amazing golf courses, and many flower gardens also call Carlsbad home. It’s a virtual treasure trove of things to do, see, and even taste. The only thing it doesn’t have is the usual crowds one might expect to find in a purely-tourist-oriented city. Whether you’re from Carlsbad, just passing through, or looking for a new favorite vacation spot, you couldn’t ask for anything more than personal, homey touch of this big small town.